Adopting a 1:1 model requires sustained individual and full-faculty commitment to change. Teachers at every level of readiness -- Early Adopters (Explorers), Early Majority (Pioneers), and Late Majority (Settlers) -- have key roles to play, and need to find ways to communicate and collaborate together. Professional development, supported by consultants, or structured by a pre-packaged solution, can initiate this cultural and organizational change. However, to sustain local capacity for ongoing innovation, faculty must share with and learn from each other, not as part of an external professional development initiative but as standard collaborative practice. There are four domains of activity associated with Communities of Practice: Informal Collaboration, Shared Knowledge, Group Activities, and Shared Knowledge Management. 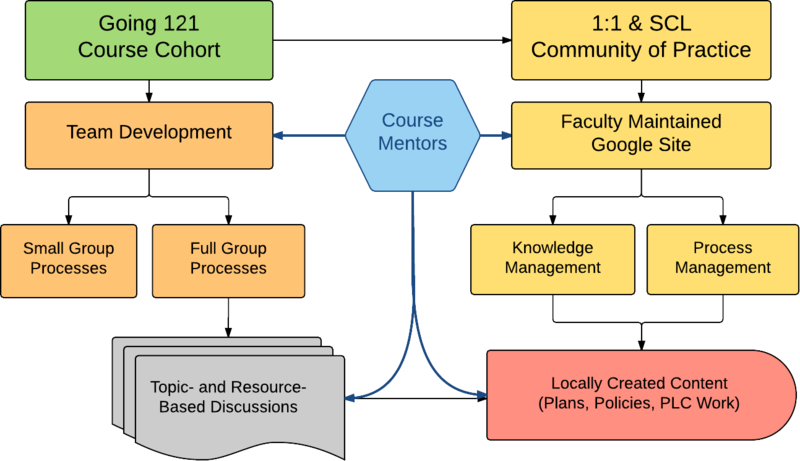 Going121 cultivates each of these, by relying on a formal course to initiate and support small and large group process and discussion, and engaging Course Mentors for facilitating knowledge sharing between teachers in various ways. Below are some examples of CoP cultivation during the course, and ways we foresee these patterns continuing afterward. During Course: Teachers use Docs, Groups and Hangouts together for collaborative tasks. After Course: Grade level teams apply course patterns for Docs, Groups and Hangouts. During Course: Mentors serve in tech support and integration support roles. After Course: Mentors continue to serve as integration coaches. During Course: Teachers use Quad Peer Review to refine 1:1 lessons and materials. After Course: Co-Teachers continue to apply peer review patterns to create lessons. During Course: Teachers share materials as course assignments via ePortfolio Blogs. During Course: Google Hangouts are used for check-ins and to discuss integration models. After Course: Teachers showcase successes for peers in Hangouts-On-Air. During Course: Readings and tasks share and reinforce strategies for teaching with technology. After Course: Teachers initiate topics for Google Group discussion, many others join in. During Course: Mentors take responsibility for supporting technology professional development. After Course: Mentors continue to organize professional development for conference days. During Course: Mentors organize CoP Google Site to highlight teacher blog posts model lessons. After Course: Teachers continue to reference CoP Site, and share blog posts and lessons there. During Course: Mentors consolidate information sources and repositories into one Google Site. After Course: Google Site remains a portal to shared references and ongoing process documents.